We understand this time may be difficult for you and your family. With this in mind, we've created $9 Debt Education to be as easy and cost effective as possible. 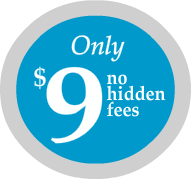 Some other providers charge three or four times more than what we charge for the same service. Our name says it all: $9 Debt Education. One price, always. Company principals have been involved in online education for over 12 years and financial planning and education for over 20 years. We've combined our experience, technical knowledge and capabilities to create the best debtor education course possible.